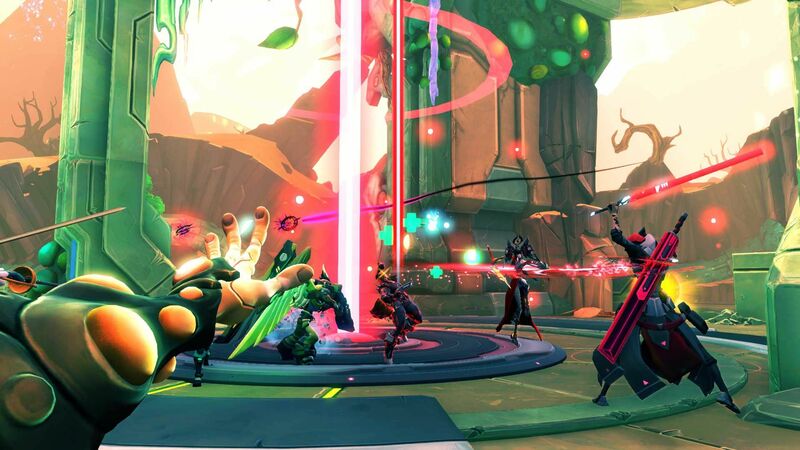 30 badasses – each with wildly different personalities, powers, and play styles – are yours to command in Battleborn. 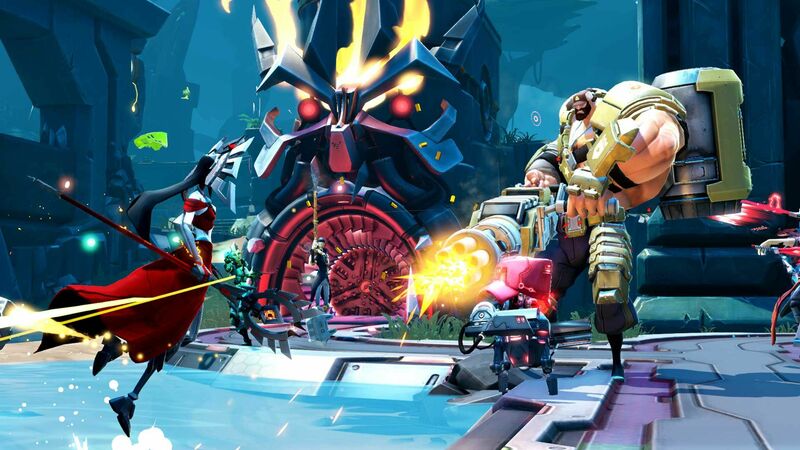 The Battleborn Free Trial gives you unlimited access to all the Competitive Multiplayer modes, no strings attached. Download the Free Trial now for your favorite platform: PC, Xbox One, or PlayStation 4! 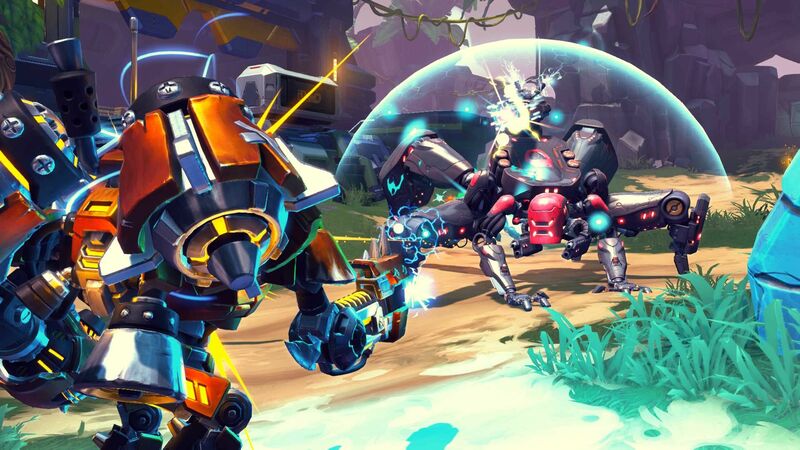 Those of you who’ve never played Battleborn before may be wondering what to expect from these awesome Competitive Multiplayer throw downs. We’re here to walk you through each game mode. 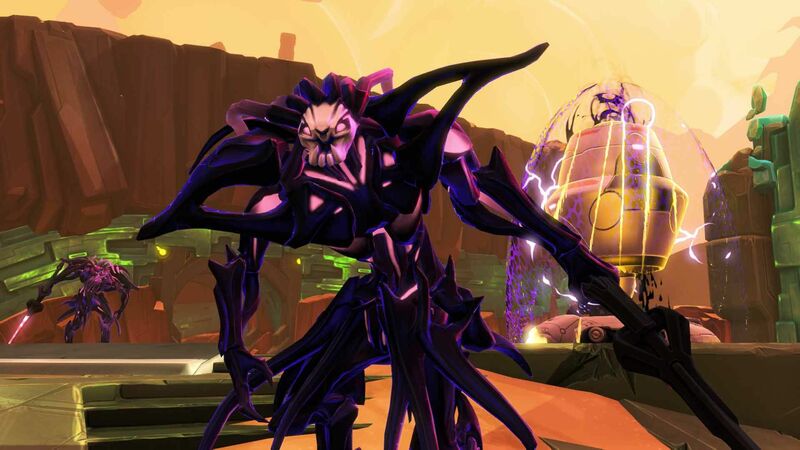 First, let’s take a quick look at Shards and Buildables – two things that you’ll use frequently in Battleborn’s multiplayer modes. Shards are in-match currency. Collect shards to activate gear and buildable emplacements around the game maps. Shards don’t persist outside of an individual match, so take full advantage of these and don’t hoard shards during matches. Make sure you’re activating your gear and supporting the team by constructing buildables. Buildables are tactical structures which are located strategically around the map. At these locations, you can activate Automatic Turrets and MX.Elite Bot super minions to add more firepower to your forces, or Supply Stations and Accelerators to keep your team supported and give them a boost. Make sure you gather enough shards to power up your defenses. Objective: Each team must march waves of minions to their death at the chompers at the ends of each lane. Sounds like fun, right? Think of it like a homicidal robotic sport. You score points for every minion bot that throws themselves into the incinerator. 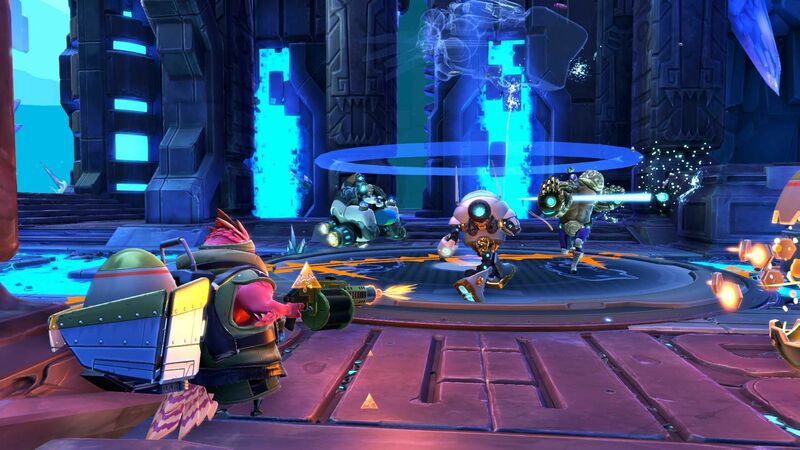 During the final stage of battle, Ultra Minions spawn and the first team to send one to the grinder wins. Just because the enemy team beat you to the half way mark doesn’t mean the match is a lost cause. Their grinder locations will move further back, making it much harder for them to score and easier for your team to catch up. Keep track of the match timer and it will give you an edge on hitting the other team’s minions before they can respond. The team with the greater score after the initial Meltdown phase receives advantages in the Finale based off of the size of their lead, such as stronger Ultra minions and an uncontested first wave of Ultra Minions. But that doesn’t mean the other team can’t have a drastic comeback win by getting their Ultra Minions to the grinder first! Objective: It’s a classic capture-and-control showdown between two teams of heroes, but more badass. Roll as a team - Move from point to point with a teammate, as their skills can complement yours to help you capture or defend a given point. At the start of a Capture match, each player is already level 3 and has 500 Shards. Use these resources wisely. Make Helix choices and activate gear that will compliment your team and help counter the enemy team. Maximize your experience gain while supporting your team – killing Varelsi Scouts, as well as capturing, occupying, and neutralizing capture points all grant significant amounts of experience. Objective: Teams of heroes must fight to aid their minions in destroying enemy sentries while defending their own. Although killing the opposing team will grant you XP, focus on escorting your minion waves to the giant enemy sentries, so they can help take down its shield faster. Destroying the second spider sentry ends the game. Each friendly sentry is marked with a shield and enemy sentries are marked with a skull icon on the mini-map. Time your team’s pushes to the waves of minions, and let your minions take the brunt of the attack. Ranged heroes can hang back and help the minions chip away at the sentry’s shields. As soon as the sentry's shield is down, be ready to go all-in to damage it. Team composition matters –Attackers are important, but a good support or healer can be vital to keeping teammates in the fight. Heroes like Miko, Ambra, or Kleese can leave healing and shielding abilities at safe fallback locations. So, make sure to pair players when you can. Pairing a defensive hero, such as Montana, Attikus, or Boldur, with a support hero to help them hold the front line longer. Objective: Collect Varelsi masks and deposit them to earn points. Sounds simple, right? You must balance between helping your team collect masks and preventing the enemy team from doing the same thing. All the while, the unrelenting Varelsi get tougher. Use the buildable MX.Headhunter assassins! Tough, fast, and vicious, MX.Headhunters will strike down enemy players and help foil the enemy’s mask collecting progress. Similar to Super Minions, Headhunters are buildables that can be purchased in a match with Shards. There are two ways to get masks: Pick up masks dropped by Varelsi or steal them from enemy players. While Varelsi drop a limited number of masks at a time, players can carry an armful. It’s up to you to help your overburdened teammates make it to the depository. The more they have, the bigger a target they may become. Same goes for the enemy team – killing enemy players is a nifty way to steal masks, so keep an eye out for those carrying a heavy load of masks. Players drop all of their masks when teleporting. If you need to go back to base in a hurry, make sure to teleport nearby an ally so they can snag your dropped masks and get them to the depository. Coming soon, Supercharge is set to release Thursday, June 22, 2017! Here’s a sneak peek of the mode to get you prepped for battle. Stay tuned for more information on Supercharge as the release gets closer. Objective: MINREC’s at it again! He had so much fun watching the Battleborn send waves of minions to their death at the grinders in Meltdown he wanted to up the stakes. On top of ruining robots, you are also grabbing capture points to supercharge your next wave of minions. Three new maps await in these 3v3 multiplayer matches! With a large abundance of shards readily available, it's encouraged to go into matches with higher end gear than what you are used to. For The latest news on the Battleborn Free Trial, stay tunes to the Battleborn Twitter, Facebook, YouTube, and Instagram channels.